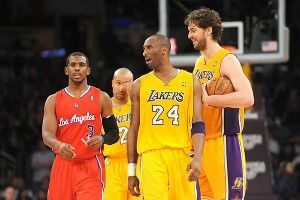 On Wednesday night, the Clippers and Lakers square off at Staples Center for their final regular-season matchup. Last time the two teams faced each other, Pau Gasol touched Chris Paul’s head, Chris Paul got mad, Pau Gasol was like, “Be easy, in Spain it is a sign of condescending affection,” Charles Oakley was like, “CAN U DIIIIIIIIIIIIG IT?!?!? !” and we were all entertained. So it’s a little bit of a bummer to see the Clippers playing down the rematch, with the mood being very shruggy and “NBD” throughout the team. Take Chris Paul’s comments, for instance: “We don’t make too much of it. First of all, it’s been so long ago that we played them. We’re two totally different teams. I don’t even remember that last game too much.” Oh yeah, Chris Paul, you totally haven’t checked to see if the Lakers changed their relationship status. Blake Griffin was similarly Mr. Cool Guy about it all: “It’s not really a rivalry. It’s a game between two teams that play in the same city, play in the same building. It’s just another game.” Two teams playing in the same city and in the same building? That is basically the JULIA CHILD RECIPE FOR A RIVALRY. All you have to do is put it in the oven and wait till it browns on the top. Jokes. We are doing the Birdman hand rub in anticipation.